We have seen the likes of Brock Lesnar successfully switch from the Ultimate Fighting Championship (UFC) to the WWE and Ronda Rousey has also been arguably successful despite the treatment meted out to her by the company. While we have also seen the unsuccessful transition of CM Punk from a WWE wrestler to a MMA artist in the UFC. However, such switches rarely ever materialise and the difference between the two forms of combat is noticeable if not huge. While the UFC is an actual combat sport, the WWE can be considered a ‘pseudo-sport’. Despite the hindrances that arise, such switches are also huge and command a large amount of interest from the fans. The introduction of Ronda Rousey to the WWE is one such example, and fans always love to see the stars make the switch. Brock Lesnar which was cut short by the suspension. Lesnar V Jones didn’t happen then, but there is a possibility it still could happen because technically he’s still under contract with UFC despite having signed a new bumper deal with WWE. However, that problem can be immediately solved if Jon Jones ever decides to try out his luck in Vince McMahon’s rings. Moreover he was an award-winning junior amateur wrestler in his younger days, so the transition wouldn’t really be much of a problem. The former featherweight Champion lost her title at the UFC 232 following her defeat to bantamweight champion Amanda Nunes. It also happened to be her first knockout loss in the MMA, which also shows how ruthless she can be on her opponents. Often dubbed as the “scariest woman fighter on the planet”, she is a big fan of the WWE, following it religiously and often tweeting the Superstars. Cris will definitely not find herself out of place in the pro-wrestling world, and the matchup with Ronda seems almost too tempting. She also has the support of WWE legend Mick Foley, who has publicly expressed in the past that she should be given a shot by Vince. Currently her contract with UFC has only one fight remaining, and there has been no progress on that front as of now, with UFC Dana White not being the biggest fan of Cyborg. Long before Conor McGregor arrived on the scene, Sonnen was the original biggest draw. Failed to realize his full potential simply because he couldn’t defeat the number one in both the weight classes he competed in, but boy did he know how to sell a fight. The master of trashtalking he once made the controversial statement that “he intended to buy the WWE”. Moreover, standing at over six feet and weighing around 220 pounds, it will be hard to dismiss the retired MMA artist and can be compared to Brock Lesnar and Bobby Lashley in terms of build, and obviously The Rock with his added ‘charisma’ on the mic. Because why not. The king of selling shows, he has the perfect attitude for Vince McMahon’s company. He is a huge name in sports, his PPVs have record sales. It is no wonder that WWE wanted to do business with Conor McGregor previously. Talks were held but they didn’t materialise to anything with both the sides failing to reach an agreement. It is definitely possible with McGregor showing that he is always ready for a challenge and that switching to another sport is no hurdle to it. His boxing bout with Floyd Mayweather was very much the biggest sporting event in 2017. The perfect candidate from the entire list. 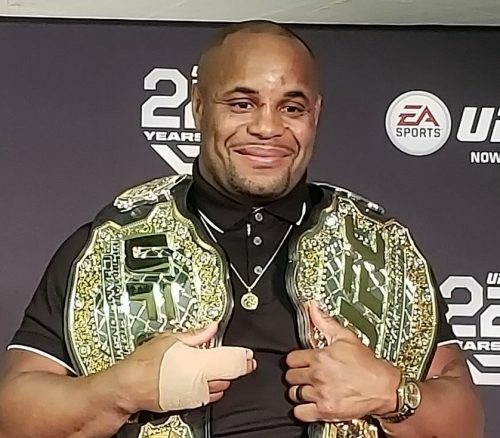 He checks all the lists – achieved the best in UFC and in the twilight of his MMA career, possesses the interest to work in the pro-wrestling industry and great character in the ring. He already had a offer from WWE to audition for a commentary role but he decided to delay that for UFC 230. Not much development has occurred since then, but it is clear that both DC and WWE are keen on working together.